More on our books page. 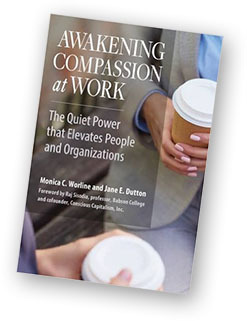 We have a growing list of highly regarded, insightful and practical books that both help the reader understand compassion and provide practical guidance to putting compassion to work personally and within their organization. Links to each book's page on the Amazon website are provided. Our expanding list of papers and articles cover information and development in healthcare, policing, and interpersonal conflict. Except where noted otherwise, these papers and articles can be downloaded, printed, and distributed under the Creative Commons Attribution-NonCommercial-NoDerivatives 4.0 International license. The International Centers In Brief and Fact Sheets are one-page information pieces that summarize key concepts such as Compassionate Conflict Management, a summary of types of human power, affect regulation, etc. These publications can be downloaded, printed, and distributed under the Creative Commons Attribution-NonCommercial-NoDerivatives 4.0 International license.